On behalf of the Town of Seabrook Island, we would like to thank everyone who came out to our Christmas Drop-In on Monday, December 17. The Christmas Drop-In is a longstanding tradition at Town Hall and, as always, it was wonderful to see so many of our friends and neighbors at this year’s event. Once again, the Town of Seabrook Island held a toy drive in support of the Toys for Tots program. This year, our donation boxes were overflowing as residents donated more than 100 new, unwrapped toys between collection points at Town Hall and the Lake House. Following the Christmas Drop-In, members of town staff brought all of the toys to our local Toys for Tots office at Citadel Mall, where they will be sorted and delivered to children in the Charleston area. To see a video of Joe Cronin, our Town Administrator, delivering the toys, click here. The Toys for Tots program was established in 1947 by the U.S. Marine Corps Reserve and has been managed by the Marine Toys for Tots Foundation since 1991. Each year, the program collects and distributes toys to children whose parents cannot afford to buy them gifts for Christmas. Since its founding in 1947, the Toys for Tots program has collected and distributed more than 500 million toys to children across the country. 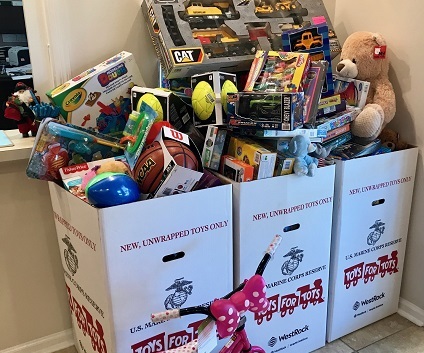 Spearheaded in the early 2000s by former Town Councilman Bob Ferguson and former Town Administrator Randy Pierce – both of whom served in the U.S. Marines Corps – the Town of Seabrook Island has supported the Toys for Tots program for nearly 20 years. We wish all of you a very Merry Christmas and a safe, happy and healthy new year!